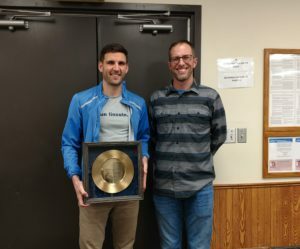 It is our privilege to recognize Johnny Rutford with the Lincoln Track Club’s 2018 Distinguished Achievement Award. His presence at the front of many local, regional, and, lately, national level races has represented the Lincoln running community well. The fact that he was born and raised in eastern Nebraska makes this award just a little sweeter. Johnny started as a young racer with the Lincoln Youth Track Club. Finding his way to Lincoln Southeast, Johnny competed for the Knights’ historic program in cross country. Earning a Super State finish (top seven across all classes), Johnny was added to the LSE’s Athletic Hall of Fame. As a three-sport athlete in cross country, swimming, and soccer, he was recognized with multiple statewide honors for both athletics and academics. Heading to Nebraska Wesleyan University, Johnny saw the light and eventually decided to focus on running for the Prairie Wolves. While we will never know what he might have accomplished on the field or in the pool, this decision turned out to be a good one. Over three years of running for Wesleyan, he accrued multiple conference awards again both athletically and academically. But Johnny also began to really develop as a distance runner. After graduating in 2013, he turned his talents toward the roads. Finding success in many of our local Lincoln Track Club races, Johnny has approached or surpassed many of his PRs. All of those races—the 5Ks and 10Ks, the competitive half marathons—led to the 2018 edition of the California International Marathon. He had one of those days that runners dream about. Where believing in the process and putting in the hard work paid off in a lifetime PR of 2:17:59. This qualified him for the 2020 US Marathon Olympic Trials in Atlanta. To say we are proud of Johnny would be an understatement. Johnny illustrates the traits that we as runners take pride in. As his college coach Ted Bulling said, “One of the many things I enjoyed about coaching Johnny was his focus and consistency.” Well, it paid off, Johnny. Congratulations on this award and all you have accomplished.